– Slice the chicken into long chunky strips .Put the chicken in the bowl, then the cumin, turmeric ,sugar, black pepper, fish sauce, coconut milk. Mix all the ingredients well together and leave it in the fridge overnight or at least 4 hours. – Use an electric blender to roughly blend onion, garlic, red chilli. -Put the blended paste in the pan on a low heat ,then the coconut oil,ginger,cumin,cinnamon cook gently for approx 5 minutes. Then add the soy sauce, fish sauce,sugar,coconut milk cook gently for another 10 minutes, keep stirring. – Once the sauce becomes slightly thicker put the crunchy peanut butter ,rapeseed oil,cider vinegar in and cook for further 5 minutes keeping stirring . Then remove from the heat. – In the other heated pan. Put cider vinegar ,sugar and salt. Mix gently until the sugar dissolves and leave it to cool. – Soak the bamboo skewers in water ,then put the chicken through the skewer. Drizzle the rapeseed oil on the chicken. 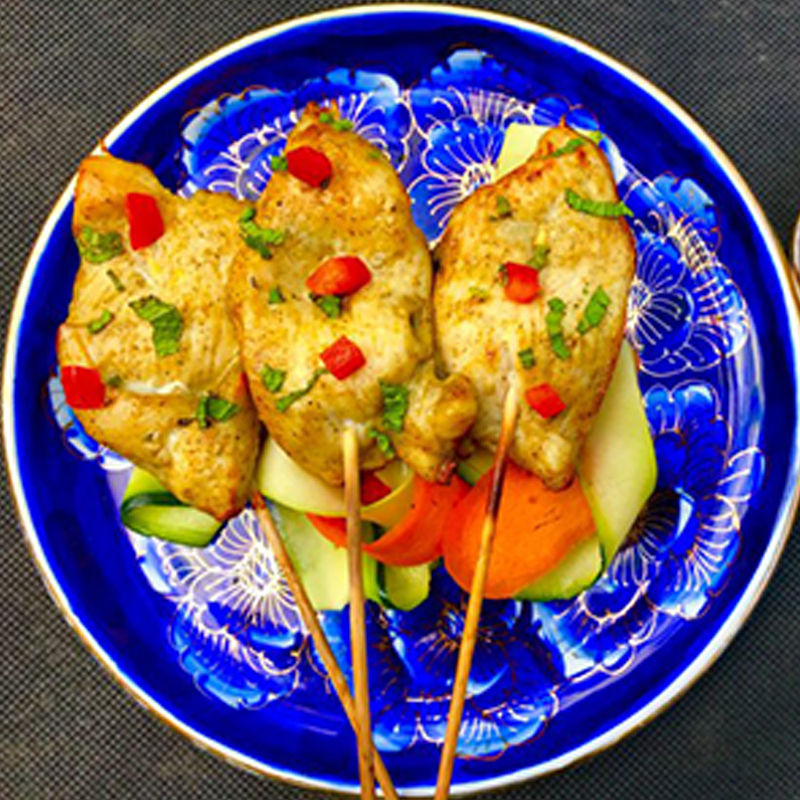 – Put chicken skewers under the grill or on the barbecue until cooked. Mine took approx 5-6 minutes on each side. – Use the potato peeler to slice the courgette and carrot into long ribbon pieces then mixed it with relish sauce. 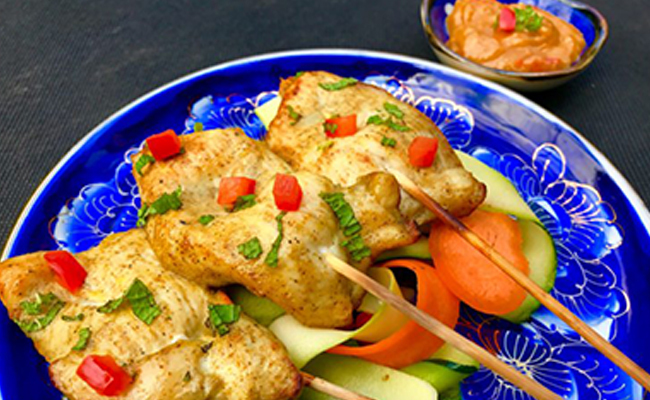 – Serve your mouthwatering Chicken Satay on the bed of refreshing courgette carrot relish and warm creamy peanut sauce.